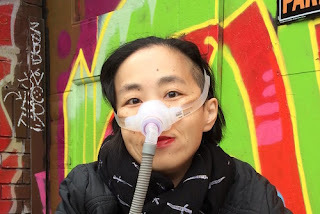 Alice Wong is the editor of the new book Resistance and Hope: Essays by Disabled People. A research consultant and disability activist, she is the founder of the Disability Visibility Project, which focuses on sharing disability media and culture. She is based in San Francisco. Q: You write that the idea for this book was sparked by Election Day 2016 and your desire to "fight back." How did you choose the authors to participate? A: I did not post an open call for submissions. As someone who never edited or self-published a book, I individually reached out to people I know and admire and asked them to contribute an essay. I wanted a wide range of people who are doing different things, each with something unique to say. Q: What themes do you see running through the essays included in the book? A: One theme is resistance comes in different forms--there are a lot of different ways of expressing resistance and being an activist, especially for disabled people. Another theme is the idea that resistance isn’t something new; disabled people have been resisting against oppression since time immemorial and we should recognize how we survived and what we learned from our ancestors. Q: How did you decide on the order in which the chapters would appear? A: I kept it very simple and listed the authors in alphabetical order by last name! Each essay is singular and there wasn’t any neat way to group them. 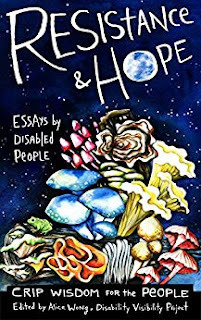 A: I hope people learn something new and that it prompts them to explore the writing and work of disabled people more. Each movement is intertwined with others and it’s time for people to start understanding the experiences of disabled people and how we are impacted by changes in this particular political climate. A: It’s been a huge learning curve and a big adventure in self-publishing so far. I’m preparing for the official launch of Resistance and Hope on Oct. 15 on Amazon and Smashwords.com. I’ve been reaching out to journalists and other media outlets about the anthology and getting ready for a social media ‘push’ once it comes out. A: Resistance and Hope is available as an e-book only and all proceeds from Amazon will go to HEARD (Helping Educate to Advance the Rights of Deaf Communities). HEARD is the only organization in the nation that works to correct and prevent wrongful convictions of D/deaf and hard of hearing individuals. In a commitment to affordability and accessibility, the anthology will be available in the following formats: epub, mobi, text, pdf, and online reader via Smashwords. People can find out more about Resistance and Hope on my website.